Step 1 Preheat oven to 400 degrees F (200 degrees C). Grease 2 baking sheets. Step 2 Dissolve yeast and 2 pinches white sugar in warm water in a bowl. Let stand until the yeast softens and begins to form a creamy foam, about 5 minutes. Step 3 Mix 4 cups flour, hot water, 3 tablespoons sugar, and salt together in a large mixing bowl; pour yeast mixture into the flour mixture and mix. Add remaining flour, one cup at a time, mixing well between additions. Continue to work the mixture until you have a dough; divide dough into 2 halves. 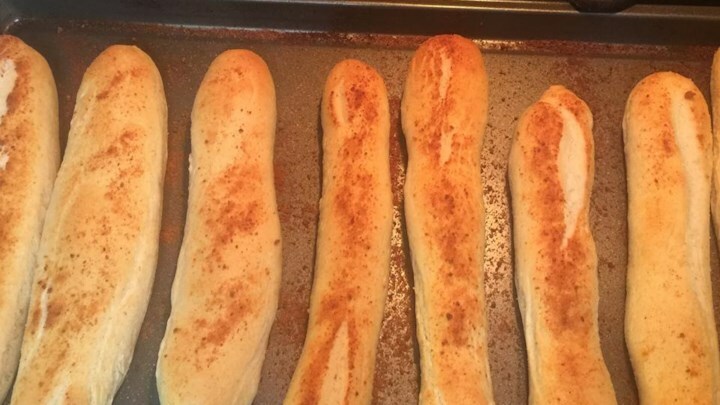 Divide each half into 12 long bread sticks and arrange onto prepared baking sheets. Step 4 Pour melted butter and sprinkle Parmesan cheese and garlic powder over the breadsticks. Step 5 Bake in preheated oven until golden brown, about 13 minutes.